" War brings out many reactions in people.The question is how will you react when things get rough? " Tasha’Vel Versea is a former Obelisk Assassin in Clan Naga Sadow, currently serving House Marka Ragnos. She worked hard to push herself, studying in the Shadow Academy and training rigorously beneath her former Master Marcus Kiriyu. As she grew up, she came from a family that expected her to uphold the family’s honor by walking the footsteps of a warrior. Never desiring to be held back by others, Tasha tends to shy away from crowds and groups, preferring to work alone- at least when she is not acting in her proper office. She seeks to gain further honor for her family and to improve her battle techniques. This desire extends to her House and Clan as well as her family. Tasha excels in martial arts training and specializes in combative telekinesis. One of her early missions was to assassinate a person stealing documents about her clan’s plans for the different house squadrons. While successful it came with a price. For a time she was hunted the shuttle owner, until the heat finally blew over. This acted as the first step in a long walk from the Dark Side to a more moderate position. In time, she would even start to edge, if not completely cross over toward the Light. As for her assassination skills, because of her warrior-like spirit, Tasha prefers up close and personal. Never backing out from a fight, she likes to taunt her enemies into getting close proximity before deliver fatal strikes from her Katranin training and her echani blade. Due to her training with Marcus, she has learned how to better calm herself during battle and observe her opponents for weaknesses. Because of her ability to calm herself, Tasha was able to teach a young upstart Corellian to think twice before attempting to fight her again. She also proved to him that even if she lost the match, she was no pushover. She was a Twi’lek born on Ryloth to Twa’kel and Rey’va Versea at the Versea estate. During her younger years, she usually was found listening intently to her grandfather, Mor’ra Tel’s war stories of his days helping the echani battle against each other in a Civil War. She made sure to finish each of her chores so she could visit with her grandfather and hear more about his heroic deeds. As she turned ten, Tasha discovered that if she concentrated hard enough, she could make small objects wiggle and move a bit. Happy at the discovery, she ran to her grandfather and showed him. This was how it was discovered that Tasha was Force sensitive. As she turned into a teenager, tragedy struck. Her beloved grandfather was dying from an illness the doctors could not figure out. As he lay on his bed, He spoke to Tasha pleading for her to take his old echani vibroblade and seek out the Dark Priests that could assist her with developing her telekinesis power. With a heavy heart, Tasha promised she would set out to become a fighter just like her grandfather and protect her grandfather’s blade. After discussing her choice with her parents, they sent her to a nearby dark temple for training. For six years, Tasha developed her force skills until she was eighteen. 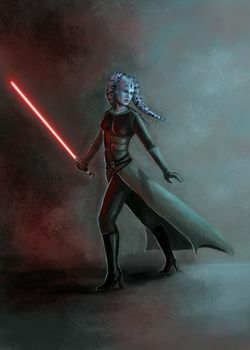 Through her dark priest connections, they told her to seek out the Dark Jedi Brotherhood in the Antei system. Thrilled at the possibility of becoming the best fighter, Tasha used her earnings from home to board a shuttle to the Antei system. When she arrived, Tasha was placed into the house Marka Ragnos of Clan Naga Sadow to start her training. 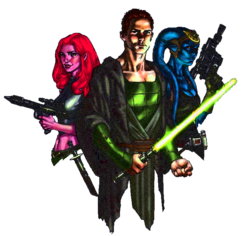 As she began her journey through the ranks, it brought attention to an Dark Jedi knight named Marcus Kiriyu. He saw much potential in having a student who was self-driven and disciplined that he took her as his new apprentice. In their first meeting, Tasha even challenged him then later after a good thrashing from her master quickly learned that she needed much more training. Marcus began teaching her how to focus her mind to become stronger in her telekinetic power and showed her how to work with an armory lightsaber. Soon she learned how to move quickly and efficiently to deliver deadly strikes to her opponents. She not only learned how to combat effectively, but even studied for a time in the shadow academy learning about philosophy, cultures, and some of the history of the Dark Jedi brotherhood. When she became a guardian, Tasha had to put her skills to the test against a human named Bentre Stahoes. Both were equally matched in battle, but due to Bentre’s quick feet and spur of the moment lekku-pulling Tasha lost the match. However she did teach the egotistical human a lesson in respect, with Bentre losing a hand before Tasha fell unconscious. From this fight, came a strong rivalry between the two and they began to compete against each other to reach higher ranks within the brotherhood. At the time she could not have known what this would eventually develop into. Soon both became Jedi hunter through their efforts. During this time, her hard work also earned her a place in the Order of the Black Guard as protector to Sanguinius Tsucyra, one of the leaders in Marka Ragnos. As part of her leadership training, Sanguinius thought it best for her to assist the new Battle team leader Armad. Tasha now has been training extensively in piloting and seeks out to help better her house Marka Ragnos and Clan Naga Sadow in her new position as Battleteam Sergeant of the Night Raptors. As the Battle Team Sergeant to the Night Raptors, Tasha began training up her piloting skills and assisting House Marka Ragnos with some of their projects. After a month of working diligently on her physical and mental skills, Tasha took the test and passed to become a Dark Jedi Knight. During this time, she fought once more against her rival, Bentre Stahoes and showed him just how much more powerful she had become. Because of their intense rivalry, it began to spark a high regard and respect for each other. A couple more months went by and Tasha eventually took a young apprentice by the name of Rayan Ortesh. She hopes that she can instill a warrior-like spirit within her young apprentice and train him to be a future fighter for Clan Naga Sadow. As she ascended into knighthood, Tasha felt that her calling of Obelisk was not helping her to gain the strength she wanted to achieve. Because of this, she felt weak and inferior. So it was then she turned to Maelous Ascarend for some guidence on becoming a Sith Maurader. Soon she began to train under a new path and felt the dark side fuel her passion for strength. Thus Tasha became an even deadlier force with a now more focused mind and body. As she continued to train, she was also introduced to Macron Goura Sadow, who as of now has begun to help train Tasha in the Echani Martial Arts style of fighting. With a sudden presence threatening the Clan Naga Sadow, the clan had split into three sides and forced her to make one of the most difficult decisions in her life. Because of her strong sense of family and wanting to protect them, Tasha'Vel choose her former master Marcus's side to help aid him in the overcoming Locke's and Vexatus's forces. As she was sent out to gather rare crystals for Marcus, she had to face many of her fellow Sadowans. During that fight, she went toe to toe with an Anzat named Darkblade and even helped convince Scarlet to join her side. Though she fought hard, the Anzat managed to overpower her and tried to feed on her "soup." It was at that moment that her grandfather's spirit who had always been with her, sacrificed himself to the Anzat so she would be protected. This sacrifice hurt Tasha so deeply that she fell deeper into the darkside of the force and vowed to have revenge for what Darkblade had done to her. After the events had taken place, she still continues to seek vengeance for her grandfather's huge sacrifice. After the event's from Awakenings, shaken a bit with the clan's decision of splitting, Tasha'Vel was able to come to terms with the loss of her grandfather's spirit and forgive her Quaestor Sanguinius Tsucyra for abandoning her. It was a rough start, but the clan once again came together to fight against the Progenitor and his droid armies. During the fight, Atra Ventus gave his life to save the clan, which helped to start a slow healing process for Naga Sadow. Because of this hardship, it has drawn Tasha a bit closer towards the light and now she follows a gray path. Following the events of Ashes Fall, Tasha worked more to help Marka Ragnos maintain its glory and service to the Dark Jedi Brotherhood. Her leadership and drive brought her into the role of Aedile. Real, she sought to prepare for wars to come. As she stepped into her new role of Aedile, Tasha also took on a Zabrak apprentice called Quo-Wing-Tzun. Having shown him some of the finer points to fighting in close combat, she decided to test his strength. Unfortunately due to Quo using terror, this prompted Tasha into a fight response that severely maimed him, however due to her quick thinking, Tasha was able to get him to the medics in time before he died. This event has caused her to now question her emotions and further actions. As time had gone by, Tasha grew closer to her former rival Bentre Stahoes and began to work alongside him to help quell his inner demons. As they occasionally fought each other as well as talk over lunches and dinner, she began to develop feelings towards this Corellian. After awhile of trying to shrug off the feelings and not being able to do so, Tasha decided to marry and share her life with Bentre Stahoes. Soon the two were married in Jasshi'rr on her home planet, Ryloth and for a time were happy. She hopes that this happiness will continue, but with the current events this blissful feeling could be short-lived. After working hard alongside her previous Quaestor, Sanguinius, it was decided by the Naga Sadow Summit that Sanguinius had been chosen to become the new proconsul of Naga Sadow. Because there was also now an opening for Quaestor, Locke decided it was in best interest for Tasha to become the New Quaestor for House Marka Ragnos. As she stepped into the new position, she now seeks someone to fulfill the role of Aedile. It was a trying and hard time as the Clan came together to take on the Dominion. The Dominion is an organization made up of humans and different alien species. As they posed a threat to Naga Sadow, Tasha was sent out with Sang, Tarrhyyn, Macron, Jade, and Macron's apprentice. As they fought their way through the Skyhook to capture the dignitary, several members were badly injured. Grandmaster Muz Ashen came to the rescue near the end and was able to get most of the crew back to safety. Unfortunately, Tasha and Tarrhyyn were separated from the group and had to get away by an escape pod. As numerous Trandoshan and Khaleesh soldiers stormed in to get to them, Tarrhyyn made a huge sacrifice and threw Tasha into the pod, closing it and sending it off into space. The Twi'lek watched the Wookie go down in one final battle as the pod jettisoned into space. Shortly after being released from the Skyhook, she was picked up by her comrades. After the whole ordeal, Tasha gave a mandatory week vacation for everyone in Marka Ragnos to rest and regain their strength. During this time, she took it upon herself to make a memorial for her fallen Aedile and placed him next to her grandfather's grave in the beautiful gardens of the Versea Estate. Soon she came across an interesting individual by the name of Ophelia. Seeing this lady's determination, strength, and adaptability, Tasha decided to make her the new Aedile to replace Tarrhyyn. Also during this time, Tasha took on Firith'rar Versea-Stormwind as her new Blackguard. Now with the Dominion weakened, She went with Locke, Ophelia, and Bentre to convince the locals of Agua'Tah to join them and crush the rest of the Dominion's forces on the planet. As Bentre was dealing with matters in House Shar Dakhan, she was informed that He had stabbed the Quaestor in a fit of madness. Because this was considered by all means treason, Tasha had no choice, but to lock him up in the holding cells on the Versea Estate on Ryloth. Currently, he is locked away under her brother's watch. Upon returning back to the Markosian City, Tasha was met by a man seeking knowledge. He had traveled a far distance, following the visions of the planet Tarthos. He claims to have sense of urgency that summoned him to Tarthos. Knowing that this man could be helpful to the Clan, Tasha directed him to Sanguinius for further assistance. Only time will tell if his questions he seeks are answered. After serving for six months as a Quaestor, Tasha began to have doubts about the recent events with Naga Sadow and felt it was good to take some time away. She spoke with the Naga Sadow Summit and walked away from leading Marka Ragnos for a time. During the search for a new leader, Muz Ashen returned to lead Marka Ragnos as the new Quaestor in rebuilding Kar Alabrek with the Aedile Riku serving under him. Darkhawk was then placed as the new Battleteam leader for the Night Hawks. With the rebuilding, Tasha hopes that this new place will serve to keep Marka Ragnos steadfast with the future conflict to come. Having left the Summit, Tasha returned to her home planet: Ryloth. There she stayed a few months and soon gave birth to a half-Twi'lek named Lynna'Vel. She cared for the child until she was summoned by Muz Ashen on an artifact mission to Moraband. She left the child in the care of her most trusted servants and Bentre's HK droid while she took of for the harsh sands. As she landed, the ground collapsed beneath her as her fellow Sadowans: Mactire, Lilith, and Firith fell into the deep tunnel's underneath. Valiantly she fought together with them against a horde of gray soldiers as they struggled to find a way out. Soon Macron arrived just in time to save Tasha'Vel from another group of gray soldiers and a baby Silooth. Soon the party regrouped and made their way through the Sith Tombs. There were several relic recovered inside the room, however one cursed doll was touched by the Twi'lek and she became as gray as the soldiers. The curse caused her to berserk into a frenzy against her own Sadowans, until Macron was able to knock her out and inject her with a very diluted form of Sith Poison to counteract the curse. Weakened, angry, but very much alive, Tasha rose again to help defend against the guardians of the tomb. 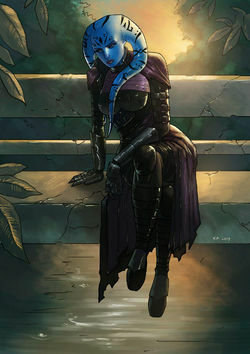 Before they were rescued, however unknown to anyone the Ancient Sith Spirit possessed Tasha and now dwells within her. Because of this, she now begins a dark chapter in her life. With the Sith Spirit dwelling within her, Tasha has gained immense power, however it is a power that comes with a price. If she utilizes her newfound strength, she may lose her sanity and her character. Currently, she is seeking to dispel this Spirit and calm her mind once again. As she looks at the new leadership now in place, Tasha hopes to see a newfound growth in Naga Sadow. One of her good friends, Sanguinius has now risen as the new Consul and her husband-Bentre Stahoes as his Proconsul. Together along with her clan, She hopes they will once again find the perfect balance in this war-torn world. Tasha now finds herself as the new Battleteam Leader of the Nighthawks and Armad as the new Aedile to Marka Ragnos. Before she could even rally up her troops, news came quickly of Marka Ragnos ships firing upon the Lotus ships opposing the Grandmaster. Such news brings sadness and even more uncertainty to Tasha's feelings. The recent events now have taken a turn. She must face this new rising war and choose her actions carefully. Also during this time, Tasha has taken another apprentice, Serge Draco. It was a bloody and grueling war against the Collective during the twelfth Great Jedi War. Instead of Clans against Clans, they had to learn how to unite against a common enemy. After the War, Tasha found herself moving onwards as the new Rollmaster of Naga Sadow. It was now her duty to help train the new recruits for battle and prepare them for the ongoing war against the Collective. She also watched as her husband, Bentre now became the new Consul and leader of Naga Sadow. Unfortunately, the Collective wasted no time in attacking and destroyed the Temple of Sorrow on Sepros. She also has been dealing with a Sith Spirit trying to take control and at this time sought out help from a couple of friends in Arcona. Tali and Aylin. She hopes to again regain control of her body and in turn help lead an attack straight into the Collective's heart. 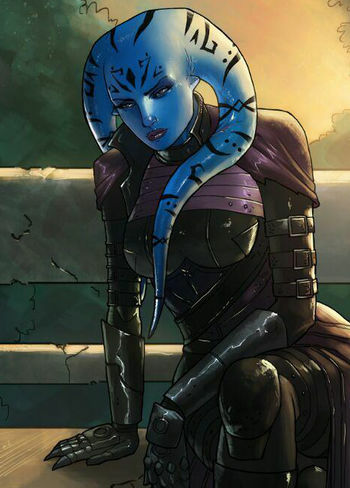 She is a Twi'lek with sapphire skin and jagged stripes tattooed down her lekku. Her emerald eyes seem to pierce through opponents as she analyzes them before she attacks. She is a little taller for her race's average height and light on her feet. Due to her training, she is also extremely fit. When she is not wearing her blackguard armor, she usually wears her typical obelisk tunic, cloak, belt and pants. Tasha almost always is seen carrying her vibroblade at her left side with a blaster hidden on the right by her cloak. Along with those weapons, she carries a red-hued lightsaber on the left clipped to her belt. This page was last modified on 20 May 2018, at 23:00.